Here’s some helpful info so you have the most enjoyable experience at the Rialto Square Theatre. Joliet has a lot of great choices right here in Downtown City Center or nearby. 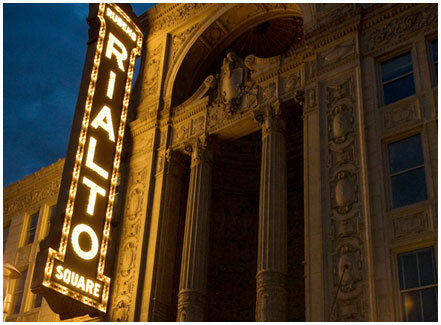 We want to make sure each and every patron has an enjoyable time at the Rialto Square Theatre. For the safety of our patrons, artists, and employees, the following items have been deemed prohibited by the management of the Rialto Square Theatre, and are not allowed in the theatre at any time. Any patron in possession of a prohibited item may be asked to surrender the item or return the item to your vehicle. In the event you chose to leave the theatre and not return, refunds will not be given. Please be advised, hand-held metal detectors may be used at some performances. Dispose of the prohibited items(s) at the door. Return prohibited item(s) to your vehicle. Leave the theatre with the prohibited items(s). Ticket refunds will not be given. Extend Your Stay. There’s a lot to do in the Heritage Corridor! The Illinois’ historic I&M Canal National Heritage Corridor is situated between Lake Michigan and the Illinois River, the region is an outdoor recreational dream, beginning with miles of trails and waterways stretching from suburban Chicago all the way to Starved Rock State Park. Stay at four star hotels to cozy bed and breakfasts, explore Route 66, shop big-names and boutiques, dine on hearty home cooking or haute cuisine, and play at the area’s exciting attractions and gaming venues.